The Staff and team at Stay Out of The Gutter are committed in giving superior care and service to all of our customers. We pride ourselves in excellent workmanship and rely on our client's referrals for repeat business. 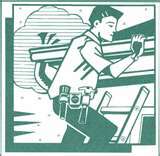 There is no job too big or small - so contact our friendly team and for all of your rain gutter needs! Lisa, Tracy, Rosanna and our staff - all ready to help in any way we can. Stay Out Of The Gutter. Your source for all of your rain Gutter needs. Stay off of your ladder! Leave it for those of us who have climbed a few ladders in the past!